THE TEMPLE BAR Hotel has been bought in a €55m deal. The hotel was bought by Singapore-based company CapitaLand’s serviced residence business unit, The Ascott Limited (Ascott). CapitaLand is one of Asia’s biggest real estate companies, while Ascott specialises in “serviced apartments”, which are furnished apartments that have amenities found in hotels but also kitchens and washing machines. The company said that acquiring the 136-unit hotel means that Ascott is now positioned “right at the heart of one of the world’s most attractive business centres”. Lee Chee Koon, Ascott’s chief executive officer, described Europe as “a key market for Ascott’s global expansion”. He pointed out that some of the world’s biggest companies, like Google, Facebook, Microsoft and LinkedIn, have established their European headquarters in Dublin. Ireland is also used as a launch pad to the European Union (EU) by many US companies and the US is amongst Ascott’s top source markets globally. Ireland has had a record number of visitors in 2016, up 12% in the first nine months of the year. Koon noted that Dublin hotels had the highest revenue per available room growth rate in Europe in 2015 and that the city is expected to top the table again in 2017. “And supply for extended stay accommodation is vastly outstripped by demand in Dublin, at only 0.08 units per 1,000 overseas visitors,” he said. Alfred Ong, Ascott’s managing director for Europe, said that Ascott has built a strong presence in Europe as one of the region’s largest international serviced residence owner-operators. “We look forward to bringing our signature hospitality to Ireland with a centrally located and quality accommodation in Dublin for our corporate and leisure guests,” said Ong. The acquisition brings Ascott’s portfolio in Europe to more than 5,400 units in 45 properties across 19 cities in Belgium, France, Georgia, Germany, Ireland, Spain and the United Kingdom. Email “Temple Bar Hotel bought by Singapore company in €55m deal”. 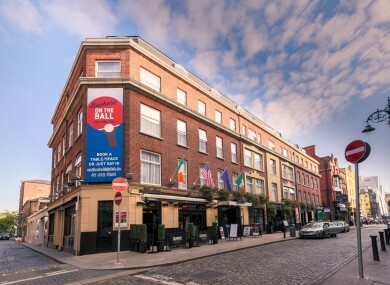 Feedback on “Temple Bar Hotel bought by Singapore company in €55m deal”.